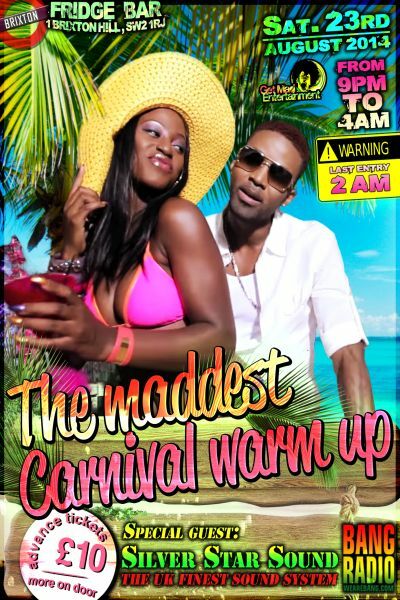 Get Mad Entertainment has the perfect formula to get you all warmed up for the Notting hill Carnival. On Saturday the 23rd of August 2014 come & rave like there is no tomorrow at the Fridge Bar located just 5 mn walk from Brixton Station. For this special occasion,’Silver Star Sound’ will be joining us. From London to Nairobi, Milan to Washington, Silver Star are one of the UK’s best known international DJs, bringing reggae dancehall to audiences far and wide. Previously broadcasting weekly, on BBC Radio 1Xtra in the UK and currently online worldwide. Advance ticket are £10 Purchase them now, they won’t last for long ! !!! Last entry 2 a.m , come early !! !